An unusual source book of jazz history, Reading Jazz (companion to Writing Jazz ) examines its roots and future, as well as its links to and influence on other forms of modern cultural expression. David Meltzer artfully juxtaposes a variety of texts to explore the paradox of jazz as an art fom preceived as both primative and modern, to consider the use of jazz as a metaphor for new attitudes, to show how it was mythopoeticized and demonized, to view jazz as a focus for a variety of cultural attitudes, and to probe its relation to other aspects of modern culture. 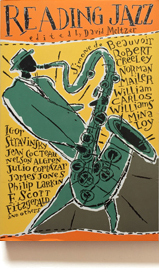 Arranged historically, both literary and popular texts are included, reflecting the interplay of jazz with both high and low culture, from such contributors as Hoagy Carmichael, Artie Shaw, Norman Mailer, Art Pepper, Simone de Beauvoir, Julio Cortázar, William Carlos Williams, Robert Creeley, and many more. Reading Jazz will be indispensible not only for jazz enthusiasts but also for anyone interested in the evolution of modern culture. David Meltzer (1937-2016) began his literary career during the Beat heyday in San Francisco, reading poetry to jazz accompaniment at the famous Jazz Cellar, and going on as a pioneer of jazz poetry readings, musician in a psychedelic folk-rock group, long-time teacher in the poetics program at New College of California, and editor of many anthologies. This publication was made possible thanks to a generous grants from the Lannan Foundation and the Reva & David Logan Foundation. Cover illustration by Ward Schumaker.